Evil has "trumped" good. The future can feel the reverberations. Here's an excerpt from an essay-in-progress by Dr. Peter Carter, an indomitable climate change activist. How bad can a Trump US presidency be? Surely it would not be the end of world? Actually it would. The surprise Trump win turns out to be the latest episode in a decades long overt conspiracy and campaign of deception and "big money" political influence by the American fossil fuel corporations to keep America and the world dependent on and dominated by the fossil fuel industry. This makes Trump the greatest ever threat to world and US national security. A Trump presidency in the United States would be the end of our world, including particularly America. During the campaign, a number of reasons were given for a Trump win to be a national security nightmare, but the greatest, most definite security issue has been all but missed. Trump as president would be the end of US national and world security because his stated agenda is to pollute the planet to death with catastrophic levels of atmospheric greenhouse gases, global warming, climate disruption, and ocean acidification. This is definite. 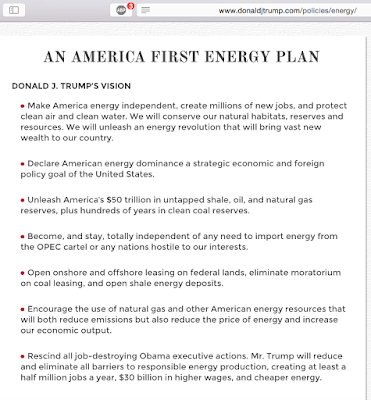 It is in his platform on his campaign website, where, if elected president, Trump promises to "unleash America’s $50 trillion in untapped shale, oil, and natural gas reserves, plus hundreds of years in clean coal reserves." That "unleashing" — at a time when we should be desperately trying to meet a goal of zero carbon emissions — would result in the collapse of the life-sustaining biosphere, both land and oceans. Since the Trump win, several reasons have been given why the Electoral College in the United States should not confirm Trump, but global climatic annihilation is not one of them. The reason a Trump presidency would be the end of the world, which he has made no secret of, is that he rejects any measures to mitigate the effects of atmospheric greenhouse gas pollution. 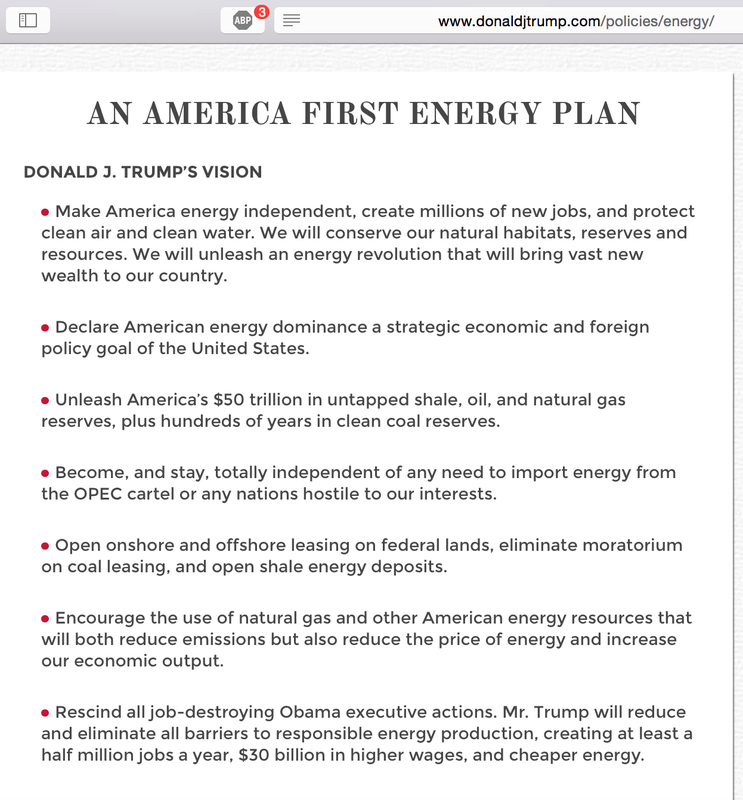 Worse still, his election platform is to burn all the American fossil fuels as fast as they can be fracked and mined. According to the science of greenhouse gases, this will lead to the end of American and world agriculture, ending civilization and making an unlivable world for today’s children. The resulting global climate disruption, with its ever escalating heat waves, forest fires, drought, ocean heating, ocean deoxygenation and ocean acidification makes the Trump agenda for his nation a death sentence for our planet. The media gave the impression during the lead up to the election that Donald Trump had no fixed policies and just made things up as he went along the campaign trail — and they are still saying he has no election mandate. That is dangerously not the case. We're now hearing that Trump is back pedalling on a lot of his campaign rhetoric, including admitting that climate change might be real. But let's not be fooled. This man is a shill for Big Money and the fossil fuel corporations — and we know they will stop at nothing. There is no longer any distinction between the Church of Greed and State in the United States of America. "Your Anger is a Gift"